The very first version of this site was created back in early 2001 using NetObjekts Fusion, looked pretty crappy and had no real content (I guess that's how all private sites start). A funny thing about this site is that the homepage states "optimized for Internet Explorer 5" while on a subpage I recommend Opera as my favorite browser. 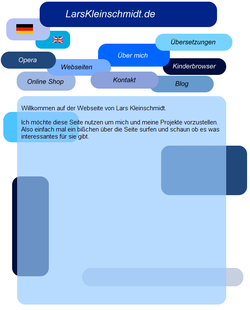 2003 version of this site used rounded fields in different shapes of blue for the navigation and a half-transparent box with rounded corners for the content. I still think the layout looks pretty neat, if it just wouldn't use that many images.